They said, no trip to Tokyo in summer is complete without climbing Mt. Fuji. It is the highest point in Japan. A volcano that is dormant since the 1700s. But climb the behemoth? And well, given the fact that the only thing I have ever climbed is a staircase, (and fallen and twisted my ankle a couple of times over there as well,) I was of the opinion that climbing and I were poles apart. I mean, I’d ask, of what joy is climbing? You subject your body to physical stress and strain, and at times even pain, to reach the top of a mountain, and then what? Subject yourself to more pain and start coming down!!! But somehow, on account of inputs from a brother, a couple of c olleagues, my boss at work and my sister, (who had gone hiking in the Alps…. Later she told me that she had only climbed down and had taken a cable car up!!) I was intrigued by the idea of climbing Mt Fuji. But I was a little apprehensive, since my level of exercise was almost zero, on account of work pressures (oh yea, I know, it is the standard excuse!!!). And the last thing I wanted was for the people in my group to get held up because of me! But somehow, it seemed as though the fact that I was in Tokyo in summer, and that there had been a couple of weekends with no rain, was more than co-incidental. I took it as a sign that maybe I must climb after all. Besides, it can sound pretty momentous if I started my climbing escapades from the highest mountain in Japan. (Maybe culminating in climbing the highest mountain in the world…. I immediately imagined!!) So I thought, maybe I must give it a shot. Then started multiple levels of research. The internet. People describing what they did, what they saw, how they went up, what to expect, what not to expect and so on. It was worth a great read. In fact those transcripts were the primary motivation for me to pen my experience as well. The first thing I came across, in most places was that one is a fool if he comes to Japan and doesn’t climb Fuji, and he is an even greater fool if he climbs twice. Hmm, interesting indeed. And then there were the endless lists of do’s and don’ts. Carry water, since water in the small stalls up the mountain can be pretty expensive, a 1000 yen as well. Carry light food, energy bars, a good jacket, a rain coat and so on. So we made a nice plan. We found a long weekend. 14, 15, 16 July. Great! Middle of summer, plus, we leave on Saturday (14th) and come down on Sunday. Rest all of Monday tending to all the sore ankles and backs. And off to work on Tuesday. To begin, we wanted to test our forbearance. So we set off on a mammoth sightseeing spree on foot. We decided one Sunday to take off to the Meiji shrine, and walk from Meiji, through Harajuku, Omotesando all the way to Shibuya, stroll in Shibuya, and then take the train back to Akasaka. We survived, with no painful joints! Yippee, we were not that old yet!!! So the plan stood. 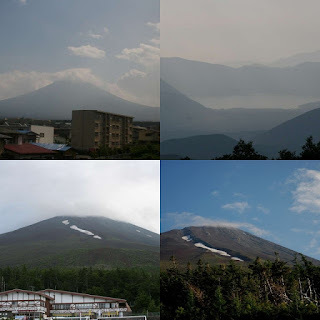 WE WILL CLIMB FUJI ON 14TH JULY. 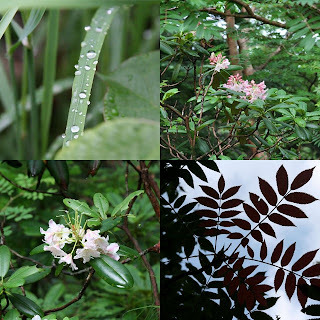 But the weather played spoilsport, and there was a typhoon alert, and to complicate matters, we had a massive earthquake at Nigata, and I felt that maybe I was reading the signs all wrong. The subsequent weekend was again lost in poor weather, and we kept wondering whether the skies would clear at all! And then came the week of 28th and 29th of July. On Friday, the 27th, we realized that we would not have any work over the weekend, and the weather forecast had been good as well. So the wish to climb started growing in us again. We were Mansi, Neha, and I. We then caught hold of another chap, Siva and convinced him to come along as well. All like minded crazy enthusiastic people. Mansi and Neha had enthusiasm that was sky high. Given a choice, their enthu alone could have launched them to the top of the mountain. 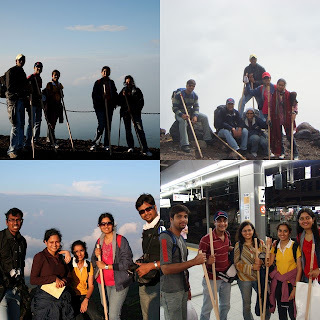 Mansi said that she knew a chap who had climbed Fuji before and he was ready to come along with us now as well. Almost instantaneously the words I had read off the internet in relation to Mt. Fuji flashed upon my mind. We nevertheless went to meet him to know what the experience would be like and what we should and shouldn’t expect. So off we went, and met Arun at Miami Garden, and over pizzas and beers, (I still think that maybe the beers convinced Arun to come along with us!!! ), discussed his previous experience of climbing Fuji. He described his attempt and to say the least it was intriguing. We decided that we were not leaving Japan without climbing Mt Fuji. After dinner, Mansi and I went shopping to get some essential reinforcements on the khaana front from Hanamasa! We bought cookies, bananas, chocolates and water. The plan was to meet Arun and Mangesh at Shinjuku station around noon on Saturday and the follow the leader for the rest of the way. So after a good sleep, we set off in the morning to Shinjuku station, met the guys and from then on, the journey began. From Shinjuku, we took the Fuji Limited Express to Otsuki. This was like the Via Rail in Canada, where you could turn your seats to face one another, and there were large glass windows on either side, offering you a lovely view of the rich Japanese countryside. This took close to 45 minutes. Thereafter, from Otsuki we took another train to Kawaguchiko. Over here, by paying an additional 100 yen per person, we could get into a special coach that had only one huge set of sofas. The sofas faced a large window, and all of us settled on the couch watching the lovely countryside go fleeting by. We sat and took tons of pictures. And soon, we caught our first glimpse of THE MT. FUJI. A weird sense of anticipation came over us as we crowded around the window cameras in hand to capture the mountain we would be climbing soon. We soon reached Kawaguchiko station, and from there, we took a bus that was to take us to the 5th station on the Yamanoshi prefecture. We were to start our ascent from there, all the way to the top… hopefully. 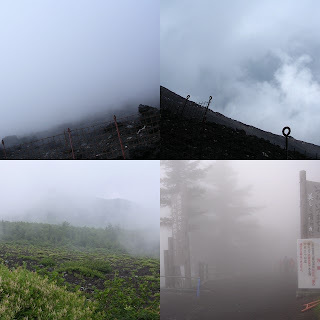 We reached the climbing point around 5 pm, and again took numerous pictures while standing down at the 5th station, and all these pictures have us smiling with glee!!!! (Oh yea, we had no clue of what was to follow). And from there began the experience. At the base camp, we bought gloves, and the climbing sticks. There is a smal l bell tied to the top of the stick. Apparently that bell is for fending off bears!!! However, as you start climbing the constant clang of the bells on the sticks of the enthusiastic climbers tends to get to you. So, we all untied our bells and put them away. The initial part of the climb was like climbing a staircase. The sun was on its way down and we got a chance to savor the lovely surroundings. There is a lovely wooded area; fully green, smaller hills reside in adjoining areas, all in all making the si ght very pretty. As we started climbing, the lack of exercise began getting to me, and I had to stop to catch my breath. What happens is that as you climb, your heart begins to beat faster, and you encounter a dropping level of oxygen in the air. If the situation goes out of control, you fall prey to what is called altitude sickness. Symptoms. You get dizzy, feel like throwing up and generally make a mess of the climbing experience. Yes, I mean it literally as well. I was in no mood to let that happen. The key? Stop every few minutes, and regain your breath. As we started climbing, I was anxious to know whether we had made sizeable progress. And as we climbed, we thought we had crossed the 6th station, which might have been a tiny stop somewhere in between. So filled with a sense of achievement, in spite of the fact that I had begun creaking in places, we climbed for nearly 2 hrs, only to be met by a huge sign, saying that we had reached the 6th station! That was the first time I felt a slight sense of despair. (The first in a huge series!) But the enthusiasm had not yet begun to flag. So we continued after a small stop. We called it a Sutta stop, since the guys would be busy stopping for a smoke, and we’d stop to catch our breath, senses, and maybe rest our aching legs a little bit. As we ascended towards the 7th station, the sun had begun to set and a lovely moon came out. It then occurred to us that we were climbing on a full moon night, that too, unwittingly chosen. Then we went on further to the 7th station. This climb took comparatively lesser time. Once at the 7th station, we stopped for a while longer, and this is where the cold began to hit us. Coming from tropical countries, all of us were cold; at least I was and add to it the fact that I couldn’t fill my lungs with hot tobacco smoke to keep warm. Only then did we realize that we had managed this far without actually feeling cold, only because of the calories we were burning! The minute we stopped, we shivered. Whew!!! Soon we got moving, and started off towards the 8th station. This was a fairly routine climb, with chain-link fences bordering the climbing route. From down below, we saw a red Tori, further up and we felt that this was the top. But, when we came to the 8th station, we got a rude shock, and realized, rather despondently that Japanese put Toris everywhere! We then went from 8 to 9. The climb got a bit arduous here and hence exciting, as we tried to move on further. It was getting colder, steeper and windier. As we moved on further, we noticed that the moon was now on the other side of the mountain. Also, the climb was getting rocky and steep. The gradient was almost 80 degrees! We couldn’t climb as effortlessly on two legs as we had climbed previously. This portion of the climb had to be executed on all fours. We literally crawled, gripping rock crevices and finding foot holds in the rocky mountain face. T here were signs here and about notifying climbers that it would get pretty windy as we went further, and true to the signs, it got really windy. As we glanced to the side, we noticed a huge patch of snow on the mountain slope. And we realized that the worst was yet to come. And sure enough, it started to rain. It was so cold! SO SO COLD! Add to it the fatigue of having climbed for so long, on all fours. So we had to stop, and when we did, we shivered, BIG TIME! The rain, the wind, and the sub-zero temperatures made it really difficult to keep strong. There was a shack at the 9th station. All of us bee-lined in front of it got in and went to a coal fire there and warmed our hands. Man that place was divine. Given a choice I would have preferred to be there till sunrise! But the shack owner was one step away from throwing us freeloaders out of the shack! So we sadly moved on! Sigh! For the first time, (again the first in a long series) I began to wonder why people climb! Braving the cold, the wind, the rains, and the glaring question was…. WHY DO PEOPLE CLIMB???? By now, our energy had begun to flag. We were on the sunrise face of the mountain and suddenly, WHAM! U p ahead, we saw almost 9 zigzag rows of people snaking their way up – all the way to the top! This was where all of us sighed in unison! NO! We’d climb; stop, almost as if we were in a queue. We saw the sun come up behind us, but we had not yet reached the peak. We were however not really too bothered about that fact. We were actually happy that the sun had finally come up. At least the weather would get a little warmer, if not anything else! For the first time in life, I welcomed the sunrise, (since otherwise it is always ‘Jeez why is it morning already!! !’) By the time we reached the top, final, white Tori at the top, it was around 7 a.m. The guys went off to eat something but I stayed back to ….. SLEEP! I woke up after a while, and went off in search of the Fuji post office to post the cards I had brought with me. On my way, I passed the crater. I had read in the internet accounts that people generally walk all around the crater. But, in my case, I neither had the enthusiasm, nor the energy to walk around a gaping hole! Let alone walk around, I was having troub le walking on level ground! So I stood at the edge, and peered down below. Not a very pretty sight!!! I checked in some stalls, and they said that the post office was a good half hour away. Whoa! I didn’t have the time or the energy to walk so much, so in true Indian nature I bartered 2 of the vendor’s cards for two of my own and asked him to post them for me. He agreed and sure enough, they have reached their recipients! Marked ‘Mt. Fuji’, making them a very special collectible. I then got back to our group, and Siva, Arun and Mansi took our sticks for stamping, and soon thereafter we began the second leg of the journey – the downhill climb. To begin with, we all started coming down together, and then, unable to maintain pace, we split into 3 groups of 2 each. Siva was my climbing down partner, and I am really sorry about that. I am by and far a very poor climbing down partner, with the capability to drive away all semblances of sharafat and gentility from a decent person! Arun had told us that coming down would be easier and faster, since the volcanic mud would be loose, and we could easily slide down! That is soooooooo not true… and I realized it only after I had gone all the way up and was forced to have to come down! What happened was, we began rather effortlessly, again fuelled by will power, with a 20 degree gradient and a mild wind for company. In just a few minutes however, it began to rain and it rained hard. We were engulfed in clouds, and felt the sudden coolness as a cloud wafted past us. So the wet mud was not conducive to sliding and whooppaa… plop.. plop… I landed on the ground at least 6-7 times, twisting my ankle (which has had a history of soreness) at least twice. My gloves were wet and I could barely grip my stick, since my fingers were getting numb. But climbing sans gloves was tough, since volcanic soil can be abrasive, when you fall, and so my palms got scratched a good many times. So there I was, cold, distraught and my ankle was in agony. Poor Siva – he had to put up with all these delays – tremendous patience indeed. I still remember the gentle exhortations – ‘Just one more lane – one more’ all in an attempt to jagao the dead adventurous spirit in me. Sorry man!!! At one stage, I was really frustrated, since I had no idea how much more had to be traversed. We had a feeling that we had actually covered a decent amount of ground, and I felt that we would have not more than around 2.5 kms. We stopped some people, and asked them and they said that we still had around 5.5 kms left. I was in despair, downcast, down in the dumps, down everywhere except down at the foot of the mountain. I wished for a helicopter to appear out of nowhere and take me back to Kioicho. I wondered about the people I hadn’t said bye to before leaving and remembered the movie Cast Away. But leaving the histrionics aside, we had to move on. And move on we must. Determination kicked in – having to get over the frustration and physical pain to move on. My knees shook each time I stopped, thanks to the cold and now my calves were acting queasy as well. And I sooooooooo wanted to sleep! But we moved on and finally managed to rea ch the sixth station. After this, we took a detour and came through a forested route, which, for the record was lovely. The weather was now dew-fresh. And the prospect of soon reaching the base was even more enticing. Presently we reached the fifth station. We then washed up, posed for pictures and finally left the mountain after bidding adieu to the great Fuji san. Once out of there and on the way back home, we all spoke of the experience and after I reached my apartment, I had the opportunity to sit back and reflect. I felt happy that I had decided to ‘go for it.’ It was something I had never tried before. Something adventurous I had never done. So what if it isn’t as precarious and life threatening as an Ethan Hunt climb in MI-2? It was nonetheless pushing my body to the frontiers. To the edge of forbearance and tole rance. It felt good to know that I had taken the plunge to put myself through this to experience the exhilaration that is the ‘I am at the top’ feeling. If someone were to ask me what I gained through the climb, I wouldn’t have been able to tell them then. Because I didn’t see the lakes, thanks to the clouds, didn’t walk along the crater, since it was too tiring, didn’t catch the sunrise at the peak, and the downhill trip was painful. But somewhere, a some other level, there was a certain weird sense of accomplishment and happiness. So today, one year later, I do nothing but look back at the experience fondly, and wish I could climb another mountain soon! Excellent detail. I can side with your worry of missing sleep while on top of the world. Congratulations on the feat!! I hope the one year anniversary edition blogs are more to come. I am waiting to read of the African Safari and the Lion park experience.